Following is the opening segment of this week’s edition of Notes From the Rabbit Hole, NFTRH 504. 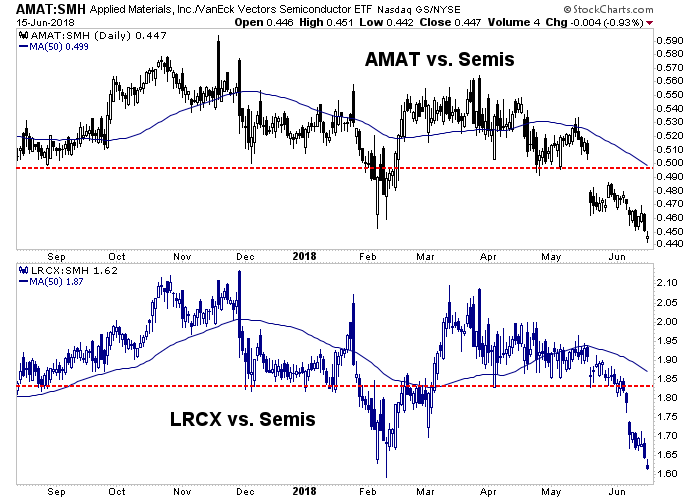 For months now we have been tracking a divergence in the key cyclical Semiconductor Equipment segment (I am short AMAT & LRCX) to the broader Semi sector and this week put more context to the divergence. 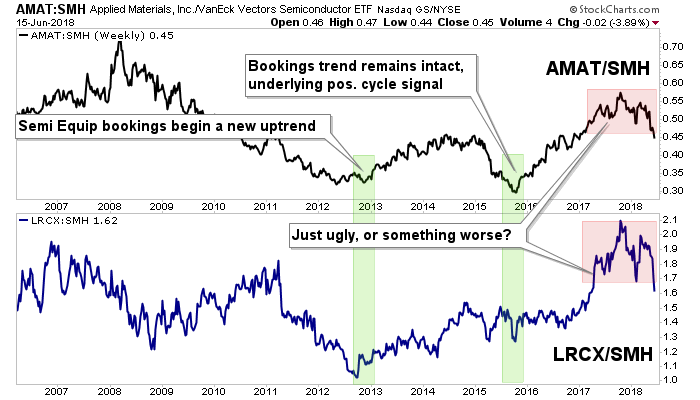 In light of the developing trade war between the US and China, let’s review the all-important Semiconductor sector and in particular, the Semi Equipment segment, which is a key economic early bird (and canary in a coal mine). Various sectors took hits on Friday as Trump moved forward with Tariffs on China. But most of those sectors and industries are follow-on aspects of the economic cycle, which got its start when the early bird chirped in early 2013. 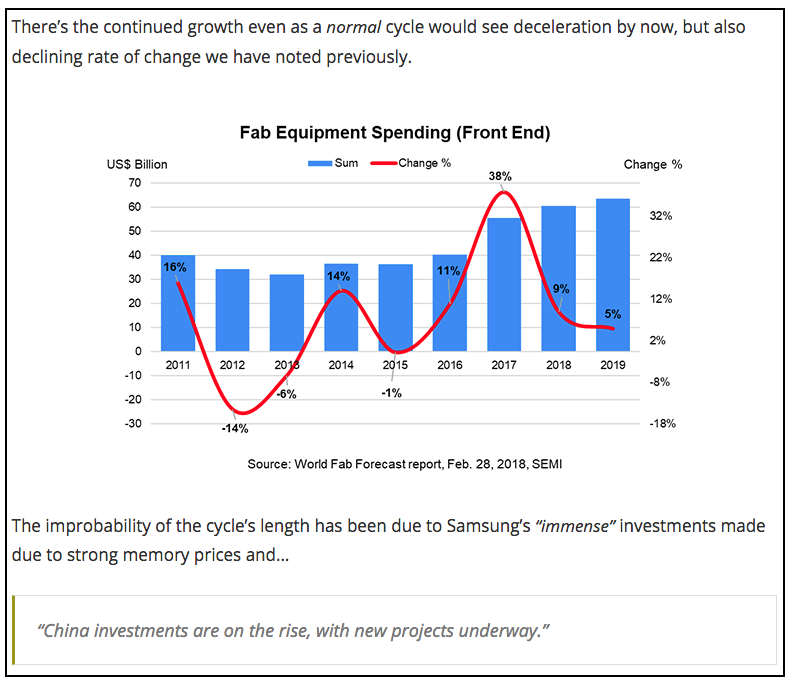 With China in Trump’s crosshairs and China a very key player in Semi Fab Equipment, there is a fundamental reason that the Equipment companies are faltering. From SEMI by way of a post at nftrh.com in March. But SEMI’s concerns about this blunt force known as Trump are real, and serious. I don’t want to pretend to be able to quantify what the gross effects will be across various industries, including the Semis. The bull is rampaging and glass is breaking everywhere. I often talk about how we should tune out inflammatory headlines, but as noted in last week’s updates, this trade stuff is real and it is fundamental. And SEMI is alarmed. 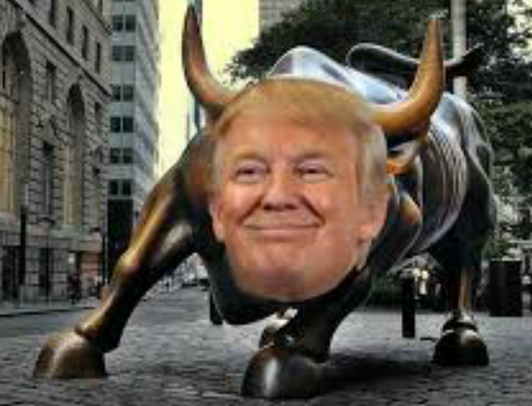 The general problem as I see it is that the bull is playing to a 1970s script. Back then the Semiconductor industry and all the technology it has enabled was just a glimmer in the eye of a few forward-looking engineers. As a kid in the 70s and as a manufacturing guy in the 80s (and beyond) I remember what US industry was like when it was fully industrial. I remember how strong and important our raw materials industries were. I am from the industrial world where families could make a good living and small towns thrived with the presence of solid industrial and/or materials corporations. But that is over by and large. After Anthony Bourdain’s death I binged a bunch of Parts Unknown episodes, including one in Appalachia, coal country. It is home to some of the hardest working, most welcoming people on the planet. It had been passed by, as we all know. Trumponomics has resuscitated coal and other pockets of industry but now let’s picture what Semiconductors are and what they mean to the US and global economies. For better or worse (and I think there is a level of “worse” in the equation) we are fully digitized, electrified and connected through myriad systems and devices. Semiconductors are in virtually everything vital to today’s information networks and the ‘internet of things’ operating in cars, homes and a million places in between. Pervasive is not a strong enough word when trying to quantify how important the Semi industry is to modern every day life. I am not trying to be cruel or dismissive of people whom time has passed by; I am simply trying to convey that Trump – through his old fashioned scope of view – threatens to impair the 90% to a degree, while bailing out the 10%. The time for Trump was in the 1980s into the 90s, before the die had been cast on the interconnected global economy and before the Fed – the true culprit in the division between rich and poor – had inflicted the bulk of its damage on society. See this Business Insider article for the full and staggering lists of items to be hit by tariffs. There is much heavy industry and some items that require Semiconductors. But the question is how will China react? With reference to the Semi Equipment Fab data noted above, and with Semi Equipment’s status of economic bellwether, I’d say we have ample reason why the (daily & weekly) charts below are doing what they are doing. Now the question is whether or not the fundamentals being broken by the bull in the China shop will spread out to the rest of the economy just as the positive fundamental cycle that began in early 2013 did. Again, I am usually the one asking us to tune out the big, alarming stuff in the news. But Trump/China is fundamental and the bull is playing to a 1970s script. It is a recipe for disaster if the bull keeps charging. Finally, in an update I noted that I’d try to get a hold of an old contact whose business (a large CNC machining facility) is heavily involved with Semi Equipment companies. Me: Hi Gary, it’s Gary T. Been a long time and I hope all is well. As I have been watching big Semi Equipment companies like Applied Materials and Lam Research weaken lately relative to the broad markets I thought I’d check in to see what your boots on the ground view is of these companies (incl. MKS, Brooks, etc.). Back in 2013 they led an economic cycle to the upside and I am trying to figure out if the recent weakness means much of anything now. SEMI no longer publishes bookings data so I can’t get a handle on it from that source. But if you could let me know how your Semi customers are forecasting it would be very helpful to me. Besides that, I hope business is going great and you have a good summer lined up. Maybe I can stop in some time, as I still do miss the old business and the smell of a machine shop, ha ha ha. Your letter writer back again. Backing the Bull in a China Shop out of the equation this seems to go well with our operating view that things could get rough after the market top-test plays out (Tech and Semi have after all, already exceeded and neared the highs, respectively). The question is whether the broad SPX will get there too before things potentially change for the worse. After that, again backing out the rampaging Bull, I lean bullish because the market’s major trends and major support areas are considerable.